Indie Retro News: AGONY - Amiga classic as an early prototype on the MSXturboR! AGONY - Amiga classic as an early prototype on the MSXturboR! In 1992, Psygnosis with development by Art & Magic, released the gorgeous owl flying shoot em up of AGONY for the Amiga system. It was a very impressive game for its time using features such as scales of colours done with raster lines, halfbrite graphics mode for the between-level pictures, three layers of parallax scrolling using dual-playfield mode and much more that really pushed the Amiga 500's hardware. So you'll probably see why I am just blown away by this latest heads up by Akira, of an early work in progress/concept port of the Amiga game over to the MSX using MSXturboR with GFX9000. 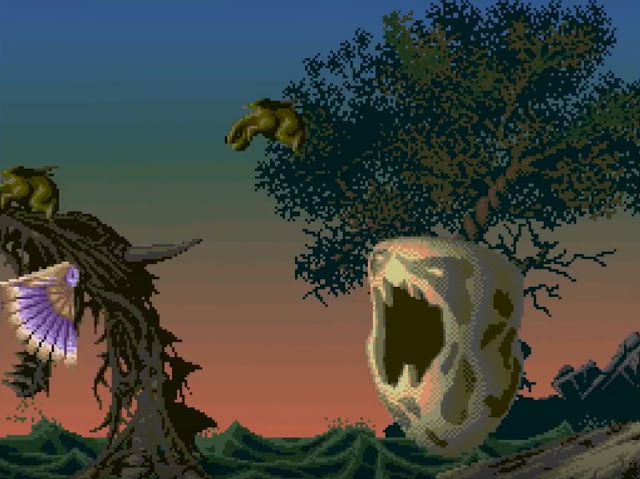 This video shows the current stage of development for the port using graphics from the original Amiga game with permission from the original author. It runs on MSXturboR with GFX9000 using openMSX and does contain some bugs and that openMSX also contains some bugs, with the result that it doesn't run as-is on the real hardware. But at least it does give you an early glimpse into what has been achieved so far by two former IOD members Mumby and Squeeky.